Often overlooked as a Soviet monolith, these pictures of the Arasan Public Baths in Almaty, Kazakhstan, suggest otherwise. A common feature in Central Asian cities, the public bathhouse is a practical meeting point with a communal atmosphere. The Arasan Public Baths house Central Asia’s most elaborate bathing spot, blending late-Soviet architectural detail with the essential elements of the spa. Rebecca Beardmore has a look around and freshens up inside. For many, bathing is an individual activity – a private washing ritual safe to indulge in once the bathroom door is locked. Bathing together is seen as the height of intimacy, either indicating a dependent relationship, such as mother and child, invalid and carer, or even something slightly naughty – two people occupying a space designed for one. When presented, therefore, with the prospect of a visit to the Arasan Baths, Almaty’s public baths or banya, the uninitiated baulk at the idea of carrying out such customarily private actions in the company of strangers, and even worse, friends. Contrary to this communal cleansing fear, a visit to Arasan is an enjoyable and relaxing experience that provides welcome relief from the heat and dust of an Almaty summer and is capable of combating the deep chill of winters where the temperature can plummet to -25ºc. With separate facilities for men and women, the Arasan Baths are a truly Eurasian bathing experience offering clients a choice of Turkish, Russian, and Finnish baths. Once in the changing rooms, the human body, so often distorted by the fantasy of fashion designers, becomes an aesthetic whole complemented by similar forms around it and contrasting with the hard marble surroundings. Wrapped in a white sheet, you begin to feel the imagined luxury of the Romans as you make your way towards the pleasant sound of splashing and immerse yourself in the steamy, soapy, airy, and most importantly, sociable atmosphere of the banya. Completed in 1982, the Arasan Baths were built on the orders of Dinmukhamed Kunayev, First Secretary of the Communist Party of Kazakhstan from 1959 to 1986. A close friend of Brezhnev, Kunayev was the only Central Asian representative in the Soviet Politburo, the select committee of super-elites who controlled the workings of the Soviet Union. 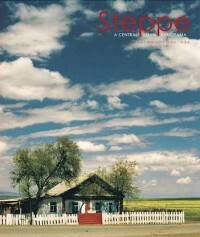 With such high connections, Kunayev was able to obtain a generous budget for the city of Almaty, which allowed him to carry out his dream of monumentalising the capital of the Soviet Socialist Republic of Kazakhstan, then called Alma-Ata. Founded by the Russians in 1854 as Fort Verny, Alma-Ata in the mid-1960s still retained the character of a village, with one- and two-storey wooden buildings dotting its streets. To Kunayev, this was unacceptable for a capital city, and he embarked upon an enormous building programme, of which the Arasan Baths were one of the first projects to be carried out, destroying much of old Verny in the process. 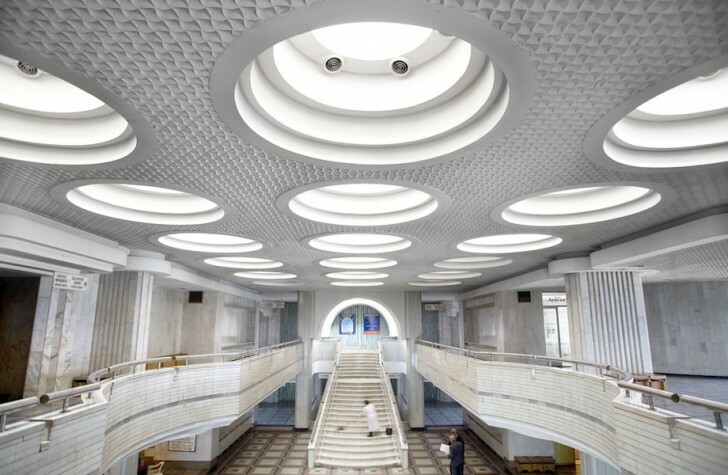 Ivan Apanasevich, local historian and specialist on Almaty’s architecture, comments that ‘civilisation talks with details’, and the Arasan Baths are a real expression of Kunayev’s desire to bring Almaty’s architecture to a level worthy of a capital city. Local architects were given a free hand to design what can rightfully be described as a ‘Eurasian fantasy’. From the outside, the monumental domes of the plunge pool atria echo those of Bukhara, while their high-ceilinged interior with its circular benches and high windows would not be out of place in ancient Rome. Decoratively too, the baths are truly lavish. Traditional oriental motifs are juxtaposed with modern ceiling fixtures to create a feeling of monumental opulence. The attention to detail is remarkable, although rarely remarked upon by the thousand-plus clients who visit the banya on its busier days. Public bathing has a long-standing tradition in Kazakhstan. Public baths were found in Silk Road towns from the early Medieval period, and the custom was reinforced by the advent of the Russians who also made public banyas a standard feature in the towns and cities which they founded. For many, public bathing was a necessity; many apartments and homes did not (and still do not) have running water and bathrooms. However, the utility of being able to wash at the banya pales in comparison to its social aspects. As Edir Khabgulayevich, director of the Arasan Baths points out, collectivism in Kazakhstan is strong; many people have billiard tables in their houses, but they still go to public places to play together, and similarly those with private bathrooms and saunas still go to the banya to meet with friends – some of whom have been visiting at the same time each week for over twenty years. The uninitiated may feel apprehensive about how the banya actually works, but once inside the predbyannik (the changing room), the banya ritual runs as easily as the abundant water inside. The most important stage of the banya is the first: a good wash. In the Turkish baths this takes place in an elegant hall where marble washstands grace a large round marble slab, functioning as a place to sit, chat, and drink peppermint tea. In contrast to the classical elegance of the Turkish section, washing Russian style is an altogether more pragmatic experience. Here, rows of sturdy washing points are occupied by bathers of equally sturdy proportions. Green plastic tubs are filled and refilled as bodies, clothes, and children are soaped, scrubbed, and rinsed with a hearty splashing – generous dollops of soap running to the floor to be swept away with the frequent changes of water. With surprising nimbleness, showers are occupied as soon as they become free, and clients move across the flooded floor with the ease of seals in water. White-clad assistants offer honey massages, flitting between their naked clients like feathers in a poultry farm. 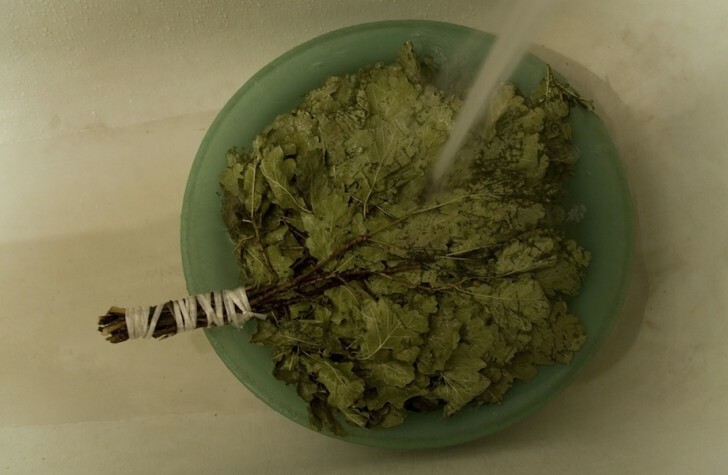 Amid this flurry of the cleansing and manipulation of flesh, vyeniki (bunches of birch and oak leaves fashioned into flat discs with branches for handles), lay softening in warm water in preparation for the next stage of the banya: the sauna. As you enter the dimly lit wooden box of the parilka (steam room), headscarf or felt hat on your head to protect it from the heat, a strange sensation that your nostrils are burning makes you wonder whether reclining on a marble slab in the dry and gentle heat of the Turkish sauna might have been a better idea. The initial shock ebbs away, and you become aware of a rhythmic slapping. 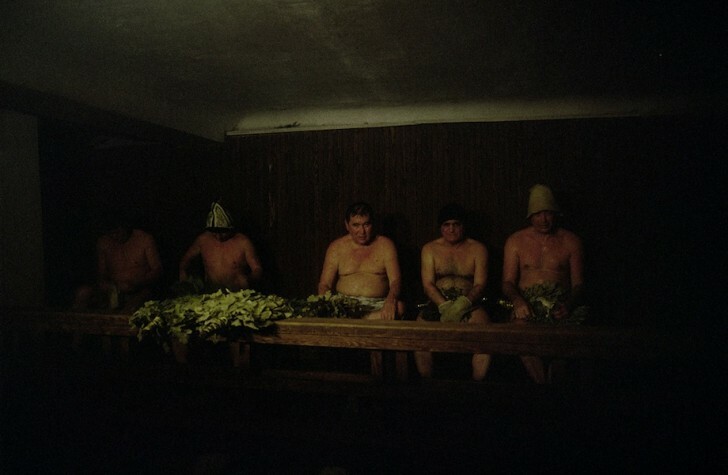 A glance towards the upper benches reveals a scene of sweaty self-flagellation as vyeniki are put to use to stimulate the skin and encourage the expulsion of toxins. Moving by stages up the dark cedar-lined stairs, the seemingly innocent upper level proves to be a burning wall of heat. All pores of the body open, and sweat runs in rivulets along temporarily paralysed limbs. A creaking sound heralds a rise in temperature (at times reaching over 100°c) as a fellow bather swings open the door of the kamenka (industrial-sized stove) and shovels water inside. The body burns in the steam while the wooden walls char in the heat. Stepping out and dashing to the cool plunge pool provides a lifeline of refreshing relief. The sudden change in temperature creates a tingling sense of dizziness, and the body awakes from feeling faint into the lofty surrounds of the circular, tiled room. By the time your body adjusts to the cooler temperature, it is time to start the process again – a routine which is repeated several times. Soft-skinned and wide-eyed, bathers gather in the changing room wrapped in towels to replenish themselves with fresh fruit juices, beer, vodka, and mineral water. For the women, hands are manicured and eyebrows are plucked, while the men might have a shave. Leaving the banya and touching beautifully smooth skin in wondering appreciation, you feel that you have been fully catered for. Every pore has been cleaned, muscle stretched, and gossip aired. The sweet warm smell of the banya remains a pleasant memory until next week, when once again you return to the sweeping staircases of the Arasan. If you are interested in learning more about Almaty and its architectural heritage, Ivan Apanasevich leads specialised tours (in English) of the city focusing on many of its unique architectural and design qualities. He can be contacted at: iapanasevich@usaid.gov or on +7.701.380.1991.